Gone are the days of lugging around a large projector for simple business meetings or home movie viewing. This list of the Best 5 Portable Projectors of 2018 offers consumers a concise list of projectors that offer budget-friendly features without compromising image quality or convenience. Whether you are looking for a projector that simply plugs into your iPhone or you want a device that can hold up to large backyard parties this list has got you covered with projectors that won’t break the bank. Many of these devices need less than a couple of meters to offer a large screen size for optimum movie viewing or professional work presentations. 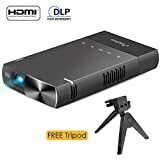 DLP mini projector for iPhone, ELEPHAS 100 Ansi Lumen Pico Video Projector Support 480P HDMI USB TF Micro SD Card. 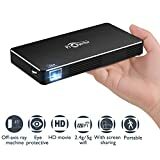 Whether you are looking for a portable projector for at home or at work this drive by New 1 offers a competitively priced option without compromising quality. With a projection screen size of 34-120 inches and a projection distance of 3-10 feet this projector can work equally well in both large or small spaces. Despite its size, this projector does not change image quality. The New 1 Portable Projector is the size of an iPhone 8 and weighs less than half a pound. With a built-in OSRAM LED lamp this projector can run an average of ten hours per day and still last for ten years before the lamp needs replacing. Designed to work equally well for either home or office use this lightweight portable projector can be used with any iPhone, iPad, or smartphone. The projection size is up to 130 inches allowing users to share presentations, movies, photos, or even games with friends and colleagues easily. The built-in 100 lumen ANSI LED bulb keeps the projection quality high even at small image sizes. The ideal projection is from five feet onto an 80-inch screen but adjustment can be made from 1.5-10 feet projection distance. Battery life allows for a two-hour movie easily and consumers will receive a free mounting tripod. 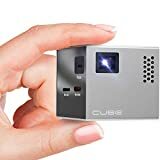 One of the smallest projectors available on the market, RIF6 Cube offers a two-inch device that delivers high-quality video and images in a tiny package. Unlike similar projectors this device allows users to connect a USB or flash drive to easily share text documents, videos, and music files. Battery life lasts up to 90 minutes and charging between uses is quick and easy. Projection screen size can adjust up to 120 inches without distorting image quality. Users will love the versatility and convenience offered by the RIF6 Cube Mobile Projector. Rated one of the best portable projectors available in 2017, this device by IDGLAX offers bright image quality with a 2000 lumen bulb. This device is a great option for home movie viewing or sharing games on the big screen with friends. HDMI cables easily connect for home movies and built-in speakers reduce the number of devices needed to enjoy the show. This projector weighs less than two pounds and is smaller in area than a standard A7 sheet of paper. All purchases are backed by a three-year warranty and professional customer support and service.